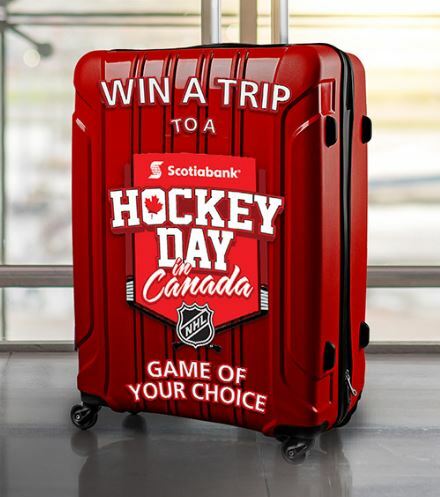 Enter the Scotiabank Hockey Club Contest 2018 for your opportunity to Win a VIP trip to the Scotiabank Hockey Day in Canada NHL game of your choice. This contest is only open to legal residents of Canada (excluding the province or Quebec) who are 16 years of age or older. To enter you first have to register to the Scotiabank Hockey Club program at the official contest web page, you can register with your Facebook, Twitter, Instagram or email accounts, then sign in and earn more entries by using the dashboard to complete actions such as subscribing to newsletters, sharing the contest and answering questions. Contest closes on November 26, 2018 at 9 am ET. Winner will be selected by random draw from all valid entries. The Scotiabank Hockey Club Contest 2018 starts on July 30th, 2018 at 9 am (ET) and concludes on November 26, 2018 at 9 am (ET). The draw will take place within three days of the closing of the contest, winners will be contacted by phone or email.